Pepsi's been the one that's piggy-backed on the Obama symbolism by plastering the sides of buses and bus stops in Washington DC. with slogans like "Yes You Can," "Optimismmmm" and "Hope." 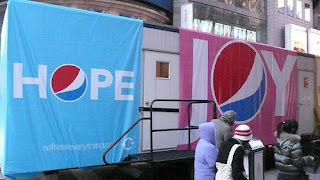 In each poster, the letter O is inscribed with the redesigned Pepsi logo, a red, white and blue sphere that echoes the rising-sun image used by the Obama campaign. But it seems at the White house its Coke that rules the roost. Several senior Administration officials are committed cola drinkers, and without fail they spend their days sipping from a can of Diet Coke, a product of Pepsi's chief competitor, Coca-Cola. Should that be a problem for Pepsi? No, unless I guess, people read the Time Magazine article. But then, even if they did, I don't think Pepsi needs to bat an eyelid, because the connect to a cola is downright psychological. Such connects are hard to sever! More so if the segment in question is GenX. After all didn't they vote Obama? My bet is, they'll stick to Pepsi.